The 4-H ATV Safety program provides grants to State-Level 4-H/Extension groups and their community partners to create or enhance local or state ATV safety projects. Riding all-terrain vehicles (ATVs) is a lot of fun, but it can be dangerous if you don't know how to ride safely. 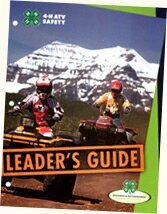 The 4-H ATV Safety program helps youth and adults ride their ATVs safely by teaching them safe riding techniques and practices and choosing when not to ride. It also helps riders build their critical thinking and life skills so that they make good decisions. Since accidents may happen to people riding ATVs, all riders (in particular youth) and parents/caregivers need to be educated about safe operation of ATVs before they climb on board. The 4-H ATV Safety program provides grants to State-Level 4-H/Extension groups and their community partners to create or enhance local or state ATV safety projects. Such projects provide opportunities for young people and adults to take action on the issue of ATV safety, ultimately influencing the behavior of people throughout a community. Grants are offered only to 4-H/Extension Programs in the United States. If you are not a part of 4-H, we encourage you to contact your local Cooperative Extension office and become a project collaborator! To help communities address issues related to safe use of ATVs. To ensure that ATV riders take a certified hands-on rider training course.